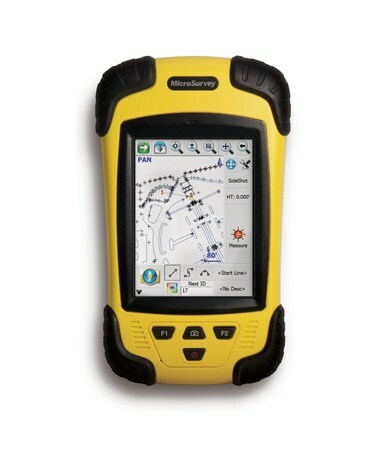 The Geomax MicroSurvey DC4 Data Collector is a handheld field computer with integrated Bluetooth, Wi-Fi, GPS and cellular connectivity for transferring survey data wirelessly. Compatible with FieldGenius data collection software, this compact and rugged device is an essential accessory to total stations and GPS receivers for performing highly accurate calculations onsite. Featuring a built-in Bluetooth, Wi-Fi and cellular modem, this Geomax data collector easily connects with other field equipment and can transfer files to a desktop computer virtually anywhere.The internal GPS is accurate up to three to five meters for navigation and mapping applications. The DC4 also has a 3-megapixel camera with autofocus for capturing and storing photos for field documentation. With a powerful 624MHz processor, 256MB RAM, and up to 8GB storage via MicroSD expansion slot, the DC4 is a high-performance device designed to work with large data sets. It is also capable of running the FieldGenius data collection software, which offers powerful staking and alignment tools, digital terrain modeling, one-tap measure, smart toolbars and more. Powered by Windows Mobile 6.5 operating system, this handheld computer has a modern user interface and runs other applications, such as Adobe Reader, Internet Explorer and Office Mobile for preparing reports and spreadsheets. For instant calculations and seamless data transfer in the field, the DC4 data collector can be used with any Geomax total station, such as the Zoom30 and ZT20. The MicroSurvey DC4 has an IP65 rating that protects it against dust and water jets from any angle. This device can even survive a drop of up to 3 feet high onto concrete and can operate in extreme temperatures. The rechargeable Li-Ion battery powers up this field controller for up to 10 hours on a single charge. This Geomax data collector package comes with USB data and charging cable, stylus pen and tether, hand strap, battery, AC adapter and 1-year manufacturer's warranty.